The NHL Power Rankings came out this morning on CBS, and to no surprise, the Bruins are posted up at the top of the ladder. With their incredibly successful month of November rolling over into the early days of December, the B’s moved from the No. 2 spot last week to No. 1 in Week 10 at 16-7-1, for 33 pts. The Bruins are currently ranked 1st in goals against, allowing a mere 2.1 goals against per game and 2nd in goals per game with an average of 3.4 pucks netted each time they hit the ice. Much of this success can be attributed to the depth of their team. I mean each line poses a threat. Going into tonight’s game vs. the Penguins, the B’s have four players in the top four spots for Plus/Minus Ratings. Yes, I said four in the top four, meaning the 1st, 2nd, 3rd, and 4th slots are occupied by Bruins. Atop the slate is the young stud Tyler Seguin. Following a competitive year where he struggled for playing time, the youngster spent the off season planning his coming out party. The early 2011-12 season is showing every sign of being his breakout year, as Seguin continues to establish a name for himself among the NHL’s best. Chara, Marchand, and Kelly polish off the other Plus/Minus spots, in that order as the B’s look to brush off Crosby and the Penguins tonight in Pitt in hopes of replicating November’s success. 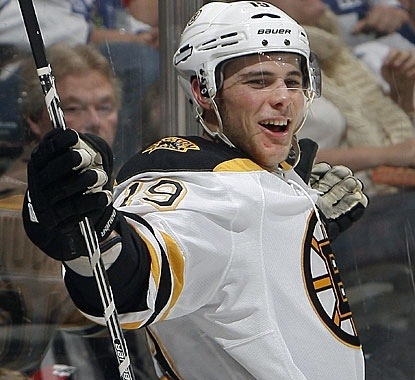 This entry was posted in Bruins and tagged boston, bruins, nhl, tyler seguin by jtulz07. Bookmark the permalink.